Here in London, the pao I like is the char siu pao (steamed buns with Chinese barbecue pork filling) from the dim sum restaurants. 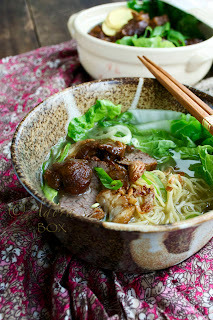 It is soft and fluffy and actually cracked at the top with the char siu peeping through. This can also be bought from the Chinese supermarket and just re-steamed at home. I am usually lazy to make this at home but since I had some leftover char siu, I thought of making pao. I have yet to crack the code on how to make the Ma Mon Luk siopao filling so this has to do for now. I used a standard yeast dough recipe for the bun. Surprisingly, it turned out like Ma Mon Luk siopao in looks and taste. How lucky is that? Put 1/2 cup of warm water in a mixing bowl and add the 2 tbsps. of sugar and the yeast. Stir, then leave for 10 to 15 minutes until frothy. Transfer to a mixing bowl and add the rest of the ingredients (don't add the full amount of flour at once; you may not need all of it). Mix well to form a medium soft dough. Knead with an electric mixer with a dough hook attachment or by hand until very smooth and elastic. Transfer to an oiled mixing bowl, roll the dough to coat with oil, cover with cling film and leave to rise in a warm place until double in bulk. Punch out the excess air, then divide the dough into 24 pieces, about 50 gms. per portion. Stretch the dough into a flat, circular shape. Put a heaping tablespoonful of filling in the middle then draw the edges towards the middle while crimping. Lay on a piece of paper (I used flattened cupcake cases) and leave to rest until again until double in size. Be patient when leaving your dough to rise. Properly risen dough will result to fluffy and light buns. Steam on high heat for 15 to 20 minutes. Put the diced char siu and the water in a pan and bring to a boil. Add the sherry, sugar and oyster sauce. Simmer for five minutes. Mix the corn flour with the water and add to the pan while stirring to thicken the sauce. Add the sesame oil. Simmer for 2 minutes. Transfer to a bowl, leave to cool at room temperature, then refrigerate to cool and set. Use to fill the buns. 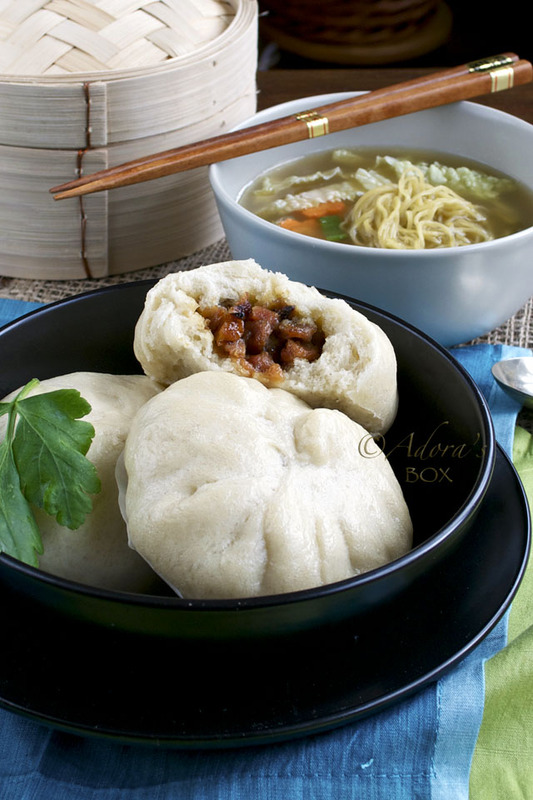 we had dimsum for lunch today and i just told my husband that i want to make my own siopao so here you are sharing yours... creative minds think alike? hihih. have a great monday.. (is it monday there already?) hmmm not sure hehe. They look so perfect and lovely- also yummy! I will have to try this soon. Oh my goodness these are gorgeous. They look so rich and inviting. looks so delicious, must have one now!!! gorgeous pictures. 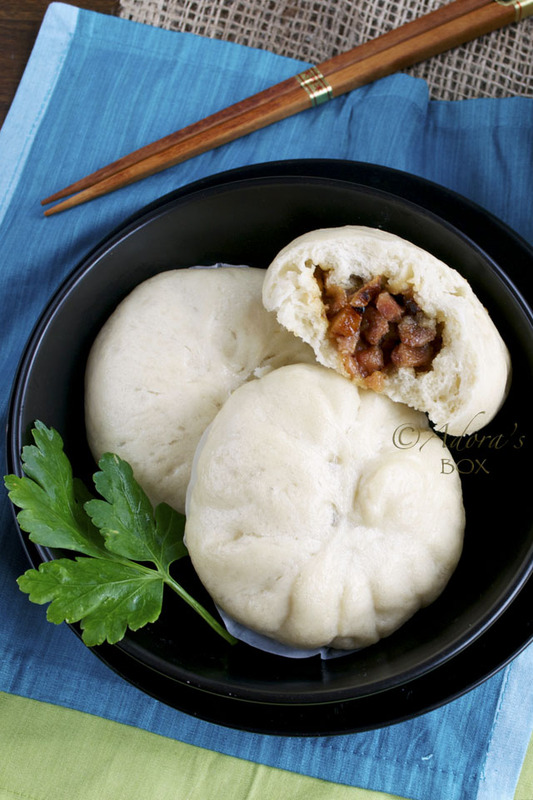 From char siu pao has been my favorite snack from childhood and I always dream about making them. Yours look sooooo delicious! Wow your pao's look amazing! How did you manage to keep the dough so white? 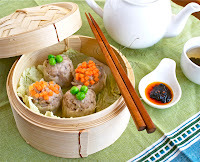 My mom always use the special pao flour because she said that using plain flour would make them yellowish. I need to try your recipe! Oh my goodness. I am definitely bookmarking this. I had my eye on some beautiful steamed buns at the Asian market this weekend but kept telling myself "make them at home". and now I know how. thank you! Hi Lilly! I actually bought the flour from the Chinese supermarket thinking it was bleached flour but it was just ordinary plain flour. It wasn't as white as the Chinese pao but it really didn't make a difference to the taste. Buzzed and bookmarked....and drooling! Happy Valentines Day! 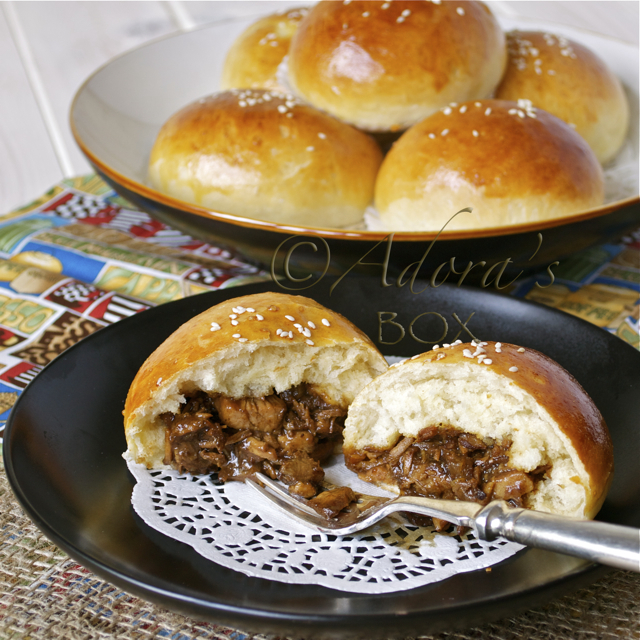 I love char siu bao! But since it's so labor-intensive we just get them from the bakery. Your bread looks so airy and light. 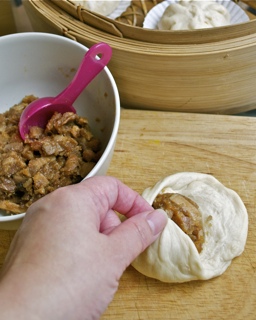 I am perpetually in search of the Char Siu Bao recipe that will work for me, but I think your technique of resting the dough after filling makes sense, so I will give this a try. It looks fluffy and yum. 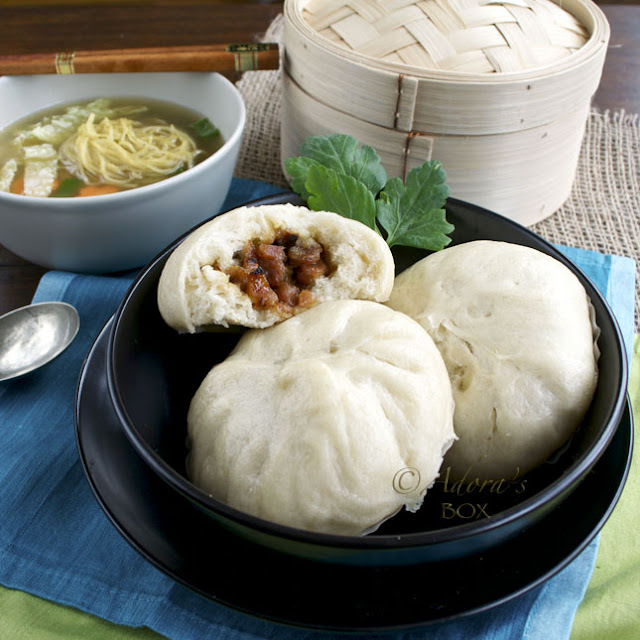 If I want to freeze some of the filled bao, do I freeze them after I have steamed them, or do I freeze after I have rested after filling? 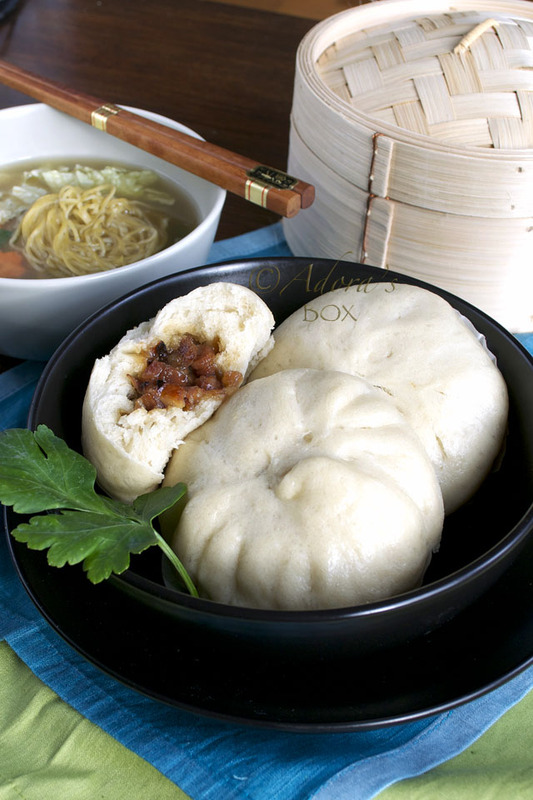 Freeze the fully cooked buns then steam again to reheat. I have a question for making the dough. I have made this recipe twice and it tastes amazing! I'm having trouble getting the dough to be as fluffy as yours. Mine just aren't quite there. When you say add 1/2 cup warm water for the yeast starter, do you only add the remaining 1 cup water to the dough later? Does it end up being a total of 1 1/2 cups or 2 cups in the end? Thank you! Can a filling with a different meat be used? I can't eat pork. Beef or chicken are suitable alternatives. I love this too! but I'm at the point now to buy? or to try again.but this sounds like its real.